Corona, CA - Pro Circuit is excited to announce the T-6 and Ti-6 line of exhaust systems are now available for the 2019 CRF450R model. 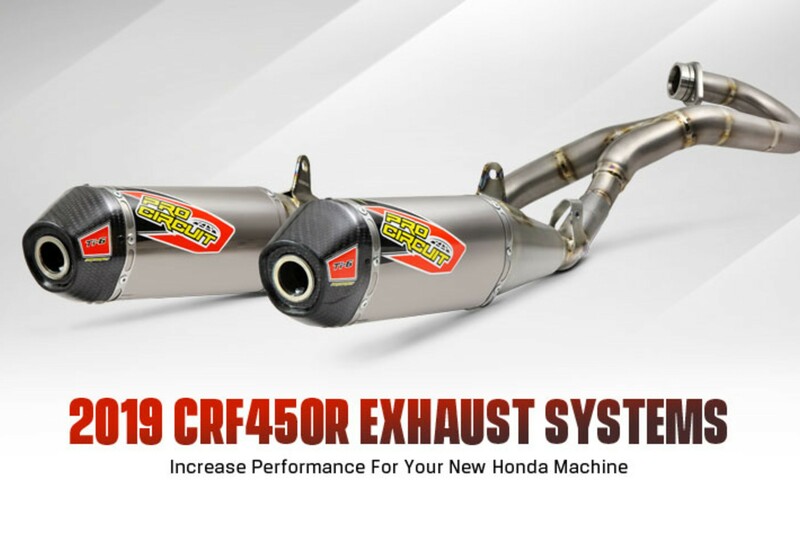 Proudly designed and manufactured in the USA, Pro Circuit's line of exhaust systems for the new CRF450R model continue with improved performance Honda riders have come to know. Whether you choose to bolt on a Ti-6 Pro Titanium Exhaust System or the T-6 Stainless Steel Slip-On Silencer, Pro Circuit has the performance exhaust you're looking for. The Ti-6 Pro Titanium Exhaust System is designed for the AMA Pro racer competing in AMA/Monster Energy Supercross or the Lucas Oil Pro Motocross Championship series. Engineered to meet strict AMA/FIM sound regulations, the Ti-6 Pro system provides superior performance while complying with the series’ sound regulations. The Ti-6 Pro exhaust system is constructed from high-grade titanium throughout with carbon fiber end-caps for a factory look. Top pro level teams look to Pro Circuit for products that win. Photos throughout the day from round four.